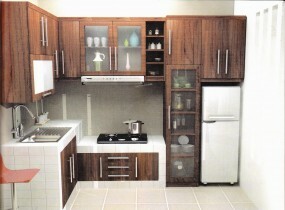 Lunarfurniture.com – Kitchen Set is one of the main decorative elements for the kitchen. Thus kitchen set is not just a benefit functionally but also provide a decorative function, which in this case would make the kitchen the home becomes more beautiful and comfortable. Therefore, when we are planning to make or buy a kitchen set, it is highly recommended to always consider the harmony between design and form so that the results obtained in accordance with what we want. When there is harmony of design and form, then every household will also be satisfied and always comfortable to linger in the kitchen at the same time also ensures that kitchen set give appropriate use. – Before buying or ordering a kitchen set, we recommend that you do the activity logging what you usually do in the kitchen. Don't forget to pay attention to the space available so that you can take into account the size of the kitchen set which is proportionate to your kitchen. – Make sure the bottom of your kitchen using a material that is resistant to heat and water vapor to accommodate portable gas stove, sink, etc. Also make sure you choose a material that is easy to clean. – Don't forget the sort position your needs while cooking. This will help you do a fun cooking activity. – Create a number of drawer and door designs to suit your needs so as not to cause excessive impression. – Provide the cooker hood so that the hot air can be sucked out. By providing the cooker hood in the kitchen set, kitchen will feel more comfortable and your kitchen furniture will be more durable. – Pay attention to lighting for Your kitchen set. The right lighting can make Your kitchen set look more alluring. – Make door cabinet as a camouflage to cover trash or gas tube. – Compose kitchen set color with the color of the kitchen walls to create an interesting room harmonization.